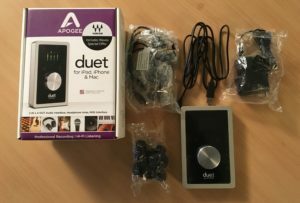 In the fourth of our USB Audio Interface reviews, Phil take us through the Apogee Duet 2. 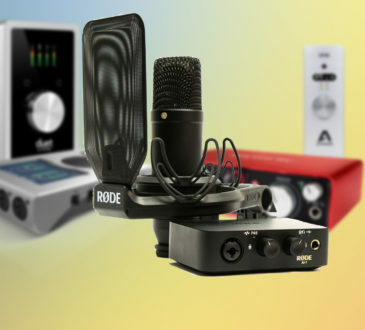 Apogee have always been at the top end of the market when it comes to audio gear. The Duet is no exception and is priced accordingly, and features Apogee’s famous “world-class” preamps and DACs, perfect for an on the move audiophile or musician who wants the best quality mobile recordings. It looks fantastic too, with a brushed aluminium chassis, black glass front and colour OLED display, one rotary dial in the middle and user assignable touch sensitive buttons. As with all Apogee products, they fit beautifully together with the Apple aesthetic and have intuitive and rock solid Core Audio integration on a Mac. In the box you get the Duet, a breakout cable for ins and outs, a USB cable and a power cable. It’s easy to get the Duet up and running. 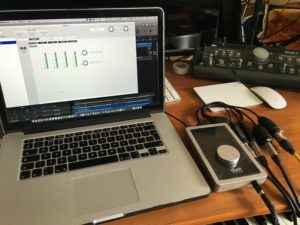 After unboxing and connecting to your Mac, a quick visit to the Apogee website gives you the latest drivers and firmware for your device, along with Apogee’s brilliantly functional Maestro software, which unlocks the Duet’s powerful and pristine technology. The breakout cable has 2 combi XLR/jack inputs and 2 balanced line level jack outputs, and connects to the rear of the unit, along with the USB cable and DC power cable, and USB MIDI port. This USB port is only compatible with MIDI devices so will not act as a USB hub for other devices. 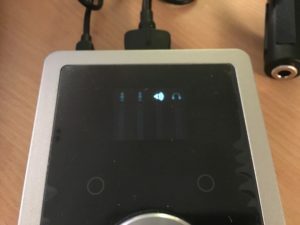 The unit is bus powered and Apogee recommend that you use like that, but has this power option which, according to their website, is “meant to be used only in extreme cases where the Duet2 would need more power.” An example of that would be running two phantom power mics at a high headphone volume. If there was a need for extra power, the Duet would notify you and take steps to make sure that the recording process is uninterrupted. There is a ¼” headphone jack at the front of the Duet. For those not keen on breakout cables and the clutter it can lead to, Apogee also sell a smart looking breakout box with the same connectivity. The substantial and satisfyingly weighty dial in the centre is both a switch and an encoder, controlling input levels, output levels and switching between them when pressed down. There are 2 assignable touch sensitive buttons to the left and right above the dial, which can be assigned in the Maestro software to very useful functions for recording and mixing. 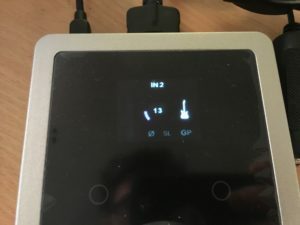 The Maestro software unlocks all the functions of the device and I found it really easy to use and set a good recording and monitoring level for my acoustic guitar. 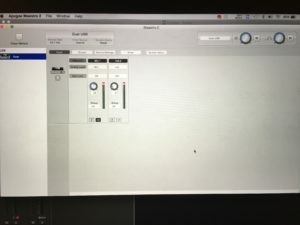 I was using a 2015 MacBook Pro and the software played nicely with Logic Pro X. The Duet functions perfectly with other DAWs too. I plugged a Rode NT1-A into input 1 and a jack from the pickup of the guitar into input 2. On Maestro I adjusted the gain levels and signal types for each channel, and routed the input through to the software mixer for low latency monitoring. The preamps sounded great, especially with the soft limit on. There was plenty of headroom and warmth to the sound of my guitar with fresh strings on, with the position of the mic noticeably affecting the sound I was getting into my headphones. I could fine tune the gain for each channel on the Duet itself very easily with the centre dial, and really enjoyed the differences in sound I was getting by moving the mic. The Duet can record at 24-bit/192KHz, right up there in terms of performance with other top-end interfaces. The preamps are a big step up compared to lower priced interfaces, as you would expect from Apogee, with massive dynamic range and low noise. The output DACs are equally as impressive as the high quality preamps – there is a huge difference in clarity and low end when using the Duet as a headphone amp compared to the built in headphone output on the Mac. I wouldn’t think twice about using this interface to capture and mix any part of a professional, releasable recording. It was quickly evident that this interface could handle being so much more than just a device to get a quick demo down. 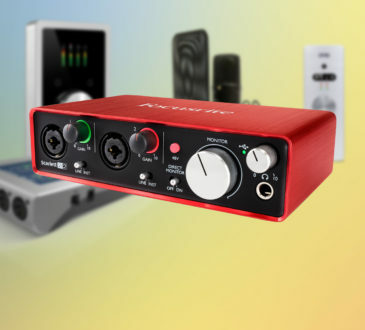 The quality of the microphone preamps and monitoring mean that you could get ‘the take’ down on the move – you’ve got a fully-fledged studio input strip in your backpack. In terms of numbers and technical specifications, the Duet matches and sometimes beats other interfaces at this price range, and the choice between products and manufacturers comes down to styling, features and your own requirements. For me, the preamps on the Duet sounded a bit warmer than those on the RME Babyface Pro which were wonderfully clean and neutral. This is neither a good nor a bad thing – both features have benefits. 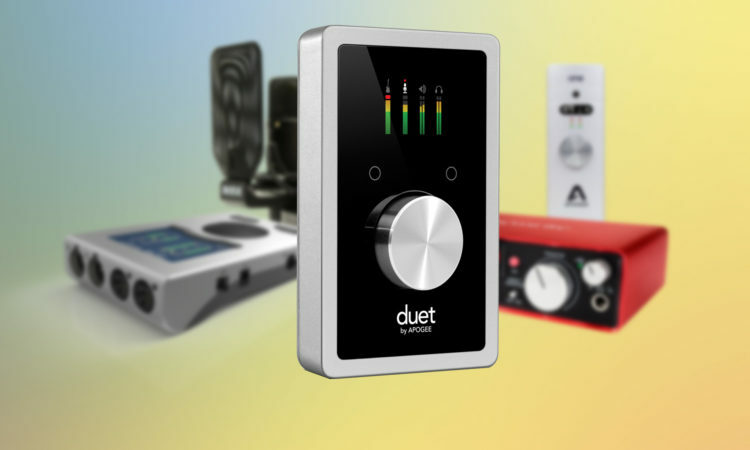 The Duet can be used with iOS with the purchase of an extra cable. There is an iOS version of Maestro which has all the same functionality as the software used on Mac OS X. There is an increasing trend toward using audio interfaces with iOS devices for field recording – you could use an iPhone camera to film something and have the highest quality audio to go with it instead of just the built in iPhone microphone – really useful for a YouTube session: 1 acoustic guitar, 1 vocal, straight into fantastic quality preamps and straight onto 4k video on the latest iPhones without any post-production. The Duet will also charge your iOS device, unlike the RME Babyface Pro. Apogee have also recently brought out Windows 10 drivers for the Duet with a full feature set, allowing Windows users to benefit from the quality that was previously exclusive to the Mac user. The Duet is available for £465. In my opinion it is worth every penny to the professional recording or gigging musician who needs limited I/O and wants seamless integration with their Apple products at the absolute highest quality. What really impressed me was the DACs. When listening to lossless music or revisiting mixes done with other equipment it opened up what was previously blurry in the mix. The Duet, paired with a high quality microphone and high quality studio monitors or headphones is definitely “world-class” setup. 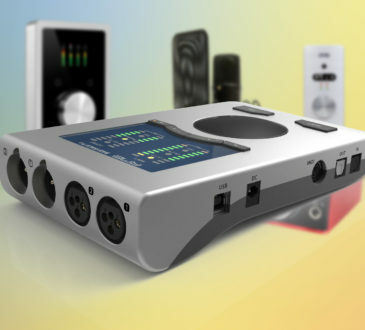 With the Duet working fantastically across a range of platforms, (Mac or PC desktop, laptop, iOS) it can be the centre of your recording or playback workflow no matter what situation you are in. If you need more I/O with the same standard of quality electronics, then the RME Babyface Pro is worth a look. 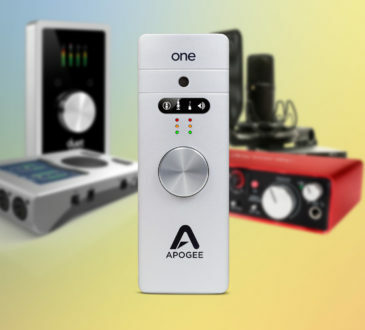 We have the entire Apogee range available on our website. ESV offer next working day delivery* FREE over £99! Prices right at time of publishing. Phil is a musician, music producer and sound technology enthusiast with years of experience in live and studio work. He works as a theatrical sound designer and sound engineer at Chickenshed Theatre in London. He is also currently producing bands and artists that have had airplay on BBC Introducing and been featured at large festivals across the UK. Recent projects include a duo named Poquet, The Tom Braggins Trio and blues/rock band Baron Goodlove & The Dreadful Noise. Jurassic World: Fallen Kingdom and more made with Blackmagic Design!